Martin Carthy and his daughter Eliza Carthy, join forces to perform songs from their first duo album, a CD of traditional material entitled the Moral of the Elephant. Martin is a legendary ballad singer and guitarist who has influenced a generations of artists, including Bob Dylan and Paul Simon. He was recently awarded a Lifetime Achievement Award at the BBC Radio 2 Folk Awards 2014. For more than 40 years Martin Carthy has been one of folk music's greatest innovators, one of its best loved, most enthusiastic and, at times, most quietly controversial of figures. His skill, stage presence and natural charm have won him many admirers, not only from within the folk scene, but also far beyond it. Trailblazing musical partnerships with, amongst others, Steeleye Span, Dave Swarbrick and his wife, Norma Waterson, and daughter, Eliza Carthy, have resulted in more than 40 albums. Eliza Carthy grew up immersed in the world of traditional music and is undoubtedly one of the most impressive and engaging performers of her generation. Twice nominated for the Mercury Prize and winner of innumerable other accolades over a 20 year career, Eliza has performed and recorded with a diverse array of artists including, Paul Weller, Rufus and Martha Wainwright, Patrick Wolf and Pere Ubu. Eliza Carthy has revitalised folk music and captured the most hardened of dissenters with her intelligent, charismatic and boundary-crossing performance. In what has become something of a parallel career, Eliza has co-presented the BBC Radio 3 World Music Awards, been a regular guest-presenter on the BBC Radio 2 Mark Radcliffe Show and has made many appearances on BBC TVs 'Later with Jools'. In her own right, Eliza has been the subject of two TV documentaries 'Heaven & Earth' (ITV) and 'My Music' (Channel 5). Martin & Eliza Carthy play at The Apex on Saturday 11 June at 8pm. 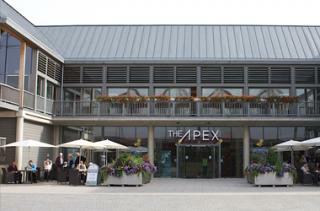 Tickets are £16, ring The Apex box office on 01284 758000 or see www.theapex.co.uk for more details or to book.